Cut your photocopy to desired size. Apply a layer of Dala Picture Perfect onto print side of the photocopy. Place wet picture onto fabric, wet side to the fabric. Roll gently with a firm roller over picture (to ensure there are no air bubbles). Place a wet sponge or paper towel over picture for 20-30 minutes. Gently remove top layer of paper with the ball of your fingertip. Allow to dry completely before painting fabric. 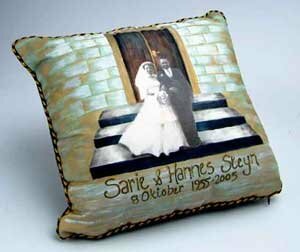 Fabric painted similar to original wedding photo, so that they are not floating in the air. Names and date done with Dala Gold glitter Liner, also painted the edges of the “wall” with gold glitter liner. Once dry, used laundry marker to outline writing. To heat set, iron on the reverse side (no steam).